Cape Town is the legislative capital of South Africa. It is also the second most populous city of the country, a seaport and the capital of the Western Cape Province. It was the site of the first European settlement in the country and hence is known as the “Mother city”. It covers an area of 2,445 sq km and had an approximate population of 3,740,026 in 2011. The Cape had been a regular port of call of European ships. In 1652, Jan Van Riebeeck of the Dutch East India Company was sent to establish a way station for Dutch ships. The settlement of Cape Town was slowly constructed. Laborers were imported from Madagascar and Indonesia and a number of exotic plants were introduced which changed the landscape here. The town was captured by the British in 1795 but returned in 1803. Finally, in 1814, it was permanently ceded to the British. It became the capital of Cape colony and got its own parliament in 1854. In 1910, it became united with South Africa and its legislative capital. In later years, the city was the home of many leaders of the anti apartheid movement. 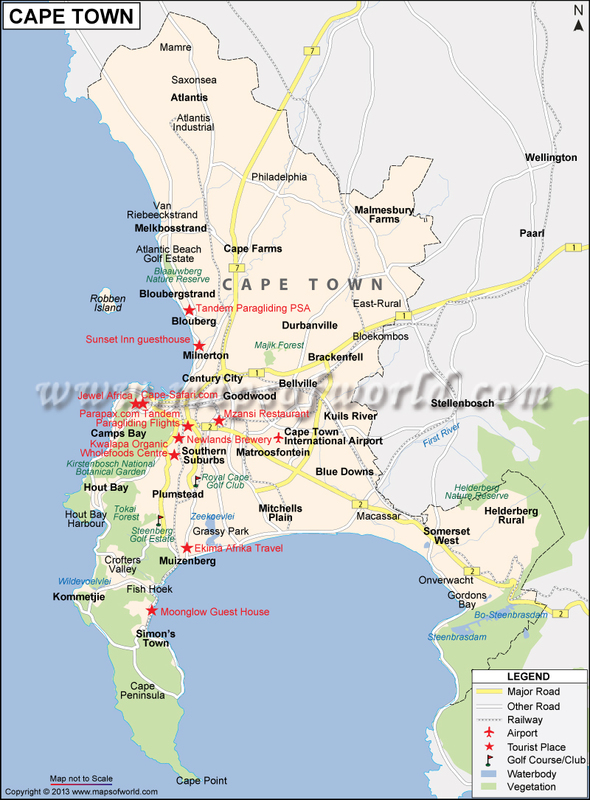 Cape Town lies at the northern end of the Cape peninsula to the north of the Cape of Good Hope. It is bounded on the northwest by the Lion’s head and lion’s rump ridges while the Devil’s peak lies to the south. The Table Bay is located on the north while marshlands and sandy flats lie on the east. These highlands enclose the central lower region called the Cape bowl. The city has 70 peaks within its limits. The city enjoys Mediterranean type of climate. Winters are mild and moderately wet while summers are warm and dry. Warm Berg winds or mountain winds blow from the Karoo region, making the city quite hot in February and March. The southerly and south-westerly winds blow from the highlands in early summer or late spring in Cape Town. These are locally called “Cape doctors” as they blow the pollution away. The city is served by the Cape Town International Airport which is the second largest in the country. Regular flight connection exists with a number of domestic destinations and international destinations in Africa, Asia and Europe. You can travel to the city by train from domestic destinations like Johannesburg, Durban, Port Elizabeth, Queenstown etc. The station is located in the city centre. Highways N1, N2 and N7 pass through the city. You can travel by road to Cape Town from Namibia, Johannesburg and Queenstown. Several buses connect the city with domestic and international destinations. Cape Town is a major port and is a standard port of call of cruise ships. You can also travel by the passenger ship on its way to St. Helena. The best time to visit Cape Town is from October to February as the weather is at its most pleasant. March to May also sees some tourist activities, though temperature drops because excellent deals regarding food and accommodation now become available. The Cape minstrel’s carnival is held on 1st and 2nd January when troupes of cape minstrels in colorful costumes sing, play and dance down the streets of Cape Town. The North Sea jazz festival is one of the biggest of its kind in the world. It is held for two days in March. The Dunhill symphony of fire is held for 4 days in April when fireworks synchronized with music is exhibited by competing nations with an exciting play off on the last day. The Cape gourmet food festival is held for two weeks in May with international and local foods offered to the public. The Cape Times waterfront wine festival is held in August when you can taste and savor the premier wines of the area. The Cape Town one city festival is celebrated in September showcasing the cultural diversity of the city with processions, theatre, music, art exhibitions and parties. The Cape Town international opera festival is celebrated for 3 weeks in September with a variety of performances. The Mother city queer project’s party is held in December. It is a colorful event of gays, lesbians and friends dressed in dazzling costumes partying all night. Table Mountain - One of the famous landmark of the city. The Castle of Good Hope is the oldest building with extensive collection of military memorabilia and art collection. The Kirstenbosch botanical garden is a beautiful collection of the flora of the Cape region. Robben Island situated off the coast of Cape Town is the site of the prison where leaders of the apartheid movement were held. It also offers beautiful scenery. The Two oceans aquarium offers a number of events including feeding of sharks and a lesson in scuba diving. There are several museums like the Bo-Kaap museum for a glimpse into Muslim culture of the area, the South African national gallery with an excellent collection of indigenous art, and the District Six museum. Cape Town offers a variety of accommodation options for all travelers. Those on a luxurious budget can choose the five star hotels including Cape Grace, Mount Nelson, and Twelve Apostles. Besides, they can also plan their stay at four star hotels including Cape Heritage, Hippo Boutique, Dutch Manor, Victoria and Alfred, Protea, and Urban chic. The three star hotels include Cape Town hollow, Stellenbosch, and 22 on Hollow. A number of charming guesthouses provide budget accommodation for budget travelers.